Kioucho Mitani, Chef Mitani’s second restaurant in Tokyo, was opened in July of 2016, located at the Tokyo Garden Terrace Complex. 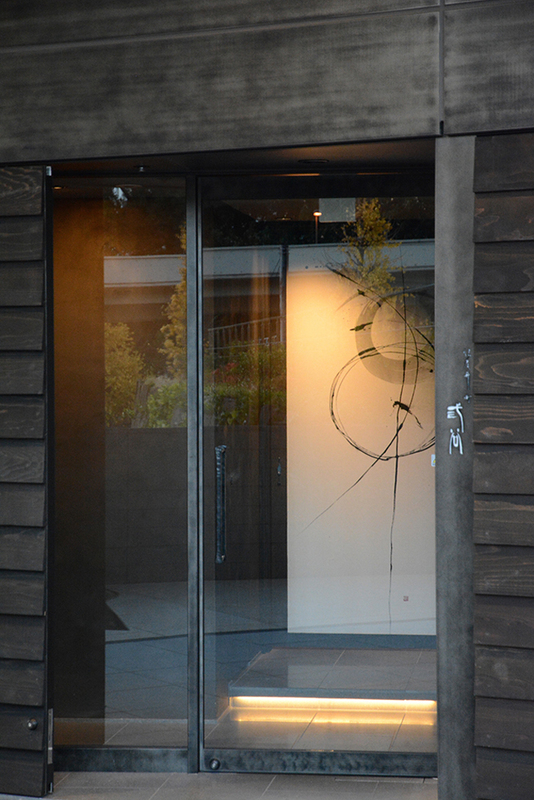 Noriko was invited to prepare a logotype for the restaurant, and large-format works for its interior. The panels for the main door and private dining room are formed of handmade washi paper, across whose expansive surfaces the calligrapher has composed a phrase from an ancient writing. The meaning of the piece is to enjoy the moment so fully one forgets to go home. This feeling of the present moment being so wonderful you do not want to leave, was captured through the movement of the brush and the gradation of the ink. The traditional phrase this piece depicts is expressed in a contemporary style to capture the essence of the Mitani restaurant.